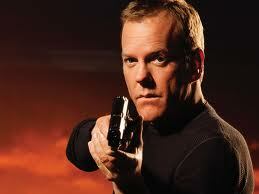 Earlier this week, Fox announced that 24 will return next summer with a 12 episode run entitled 24: Live Another Day. Little is known about the show’s return, except that Kiefer Sutherland will be back, of course, as Jack Bauer. The storyline is still under wraps. It seems unlikely that this deal to return 24 to the airwaves was in any way a means of capitalizing on recent events; I’m sure the deal was in the works long before Boston. But it does beg the question: how will 24 fit into our ongoing discussion of torture and the War on Terror? The answer might surprise you. In the late Bush years and first years of the Obama Era, Hollywood’s output reflected the voter’s repudiation of the neoconservative, interventionist approach to the War on Terror. The same year that Obama was elected, Batman grappled with “enhanced interrogation techniques” in his fight against terror in The Dark Knight. That same year, Tony Stark’s greedy defense contractor grew a conscience after seeing his weapons used by the Taliban in Iron Man. A few years earlier, Spider-Man told us that “with great power comes great responsibility,” a perfect motto for liberals opposed to Bush’s tactics and disgusted by the image of America he was projecting abroad. Likewise, the Bourne trilogy gave us a hero who defeated an corrupt intelligence agency that used every expansion of powers institutionalized by the PATRIOT Act against him. It was a liberal fantasy, and it resonated deeply with the American public. So it is clear that 24 reflected a vengeful, neoconservative approach to the War on Terror, which is probably why its ratings peaked in 2008 but dropped dramatically after the election of Obama. Still, the return of one show does not make a trend. Are there other examples of right-wing action stars returning to prominence? You betcha. Example #1: Olympus Has Fallen made a tidy profit earlier this year, grossing $130 worldwide off its $70 million budget. The film, called “Die Hard in the White House,” thematically echoed the Rogue Cop action movies of the 1980s, which promoted individualistic, conservative values and buttressed President Reagan’s calls for higher defense spending by playing up the threats posed by foreign enemies. It’s also worth noting that the film is essentially being released twice this year; director Roland Emmerich’s White House Down, which has a nearly identical plot, opens next month and is expected to be an even bigger hit. Example #2: Then there is the Man of Steel. The character of Superman has often been used to promote a strong national defense. In the original comics, Superman was a simple crime-fighter who stood up for the oppressed. In those days, he often took on greedy businessmen, but during World War II, “truth, justice, and the American Way” became codified as his motto, emphasizing patriotism over social causes.This is how it stood for many years, including in the first Christopher Reeves films, released when Americans needed some national optimism during the malaise of the Carter administration. 2006’s Superman Returns took a different tack. In that film, Perry White (Frank Langella) asks, “Does he still stand for truth, justice…all that stuff?” In an age in which superheroes reflected our ambivalence towards American power, Superman’s patriotism had to be downplayed. But even when you remove the word from his motto, Superman is still a different kind of hero, more unabashedly optimistic than the ambivalent Batman and Iron Man. It turns out that Superman was the wrong hero at the wrong time; Superman Returns was a bomb. The creators of Man of Steel appears to have learned the lessons of the 2006 disaster. Instead of playing down the patriotism with which Superman has long been associated, they’re running towards it: Warner Bros. is partnering with the National Guard to promote the film. I have already seen one Superman-themed National Guard commercial at my local multiplex, and they recently launched a website – soldierofsteel.com – to cross-promote. While it is best not to speculate too much until the film is released, it seems clear at this point that this Superman will lean a bit more towards the right. But is this enough evidence to declare a return to Reagan Era conservatism? Hardly, but it’s a trend worth keeping an eye on. Like Washington, Hollywood functions on cycles, and after the thoughtful, ambivalent superheroes of the last decade, a return to shoot-first action stars seems to be in the offing. Whether it is a reflection of an actual change in consciousness towards the War on Terror or just the cyclical nature of the marketplace, however, remains to be seen. With Obama’s second term mired in scandals and legislative gridlock, the American moviegoer might be looking for something a little less ambivalent and a little more rousing these days. Whether these conservative entertainments will translate into policy change is another question altogether.